Paul Cullington, managing director of Krusada. A well-known Peterborough entrepreneur has converted his passion for rugby into a highly profitable business venture. Paul Cullington (59), who set up rugby balls and sports kits supplier Krusada in 2012, says the business is expanding and on course to hit a £1 million turnover. Orders are pouring in from the military, schools, universities and clubs from across the UK. Now Mr Cullington, based at the Orton Centre, in Bakewell Road, Orton Southgate, says he will need another 700sqft of storage space and more staff. Krusada has six members of staff and Mr Cullington hopes to take on another one or two people. 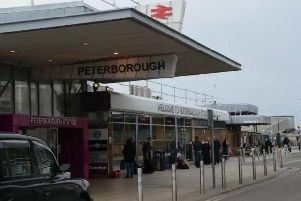 He said: “I hope to put Peterborough on the map for rugby balls nationally and internationally. Some of the Krusada team, from left, Nicole Webb, Robert Mohan, Paul Cullington and Kelly Paton. The balls and kit are made in India, Lithuania, Asia and the UK. Turnover last year was £350,000 and should reach £600,000 in the next financial year. Former Peterborough RFC player, Mr Cullington is a veteran businessman who took his firm CUK Security to a £6 million turnover before selling in 2008. New orders come from the Royal Engineers, Peterborough Lions, Oundle, Bourne and Spalding rugby clubs, plus a three year deal with ex-France international Serge Betsen’s School of Rugby.